OTSU, Shiga Pref. (Kyodo) What is thought to be the fossilized ivory of a prehistoric Naumann elephant has been unearthed from gravel along a riverbed in the town of Taga, Shiga Prefecture, the Taga Municipal Board of Education announced. 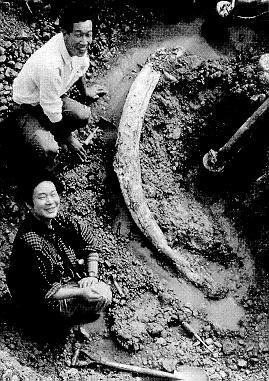 The fossilized tusk is about 210 cm long and 15.4 cm in diameter at the widest part, the board of education said Friday. It is the sixth-longest tusk found in such excavations to date, according to experts. Although the tusk appears to have broken off 20 to 30 cm from the base, it is in almost perfect condition, featuring a curve that is characteristic of the Naumann elephant, paleobiologists said. In the vicinity of the spot where the discovery was made, 13 molar teeth have also been unearthed. From the size of the fossils, experts estimate the height of the prehistoric elephant at 2.7 meters, according to the board of education. Paleobiologists believe Naumann elephants existed between 20,000 and 300,0000 years ago. Fossils of the species have been discovered at about 200 locations throughout Japan.